Don Xai (Xai Island) is an island in the Mekong River, in the southern part of the country of Laos. 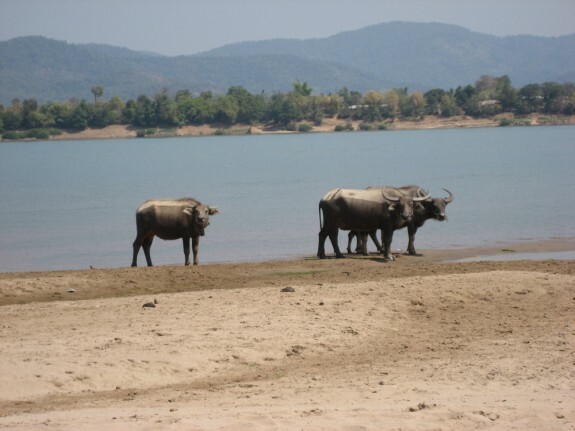 It is officially located in the province of Champasak, in the Soukhouma district. For most Westerners it is a world away, still unspoiled by modernity. On this small island are water buffaloes grazing on the sandy beach, lush green trees overgrown with tropical fruits, rice paddy fields and homes on wooden stilts. Villagers in floppy sandals quietly crisscross on dirt paths carrying rattan baskets filled with fresh fruits and vegetables. The northeastern shoreline of the island contains a row of tall historic landmark trees from which the village derives its name, Baan Thoum Ngai (Thoum Ngai Village). Over time monsoon storms eroded so much of the shore that the home Onkeo grew up in had to be taken down and moved approximately 50 meters inland. The original wooden house was built by the bare hands of Onkeo’s father Thiang. Thiang and his wife Nang raised seven children under its roof without electricity or indoor plumbing. Nang’s family lived on Baan Thoum Ngai for many generations, owning several acres of arable land on which they grew crops and raised livestock. Her family also owned land across the river on the eastern shore. Nang’s ancestors managed tenant farmers, laborers and even Kha slaves. Thiang grew up on the eastern shore of the Mekong town of Soukhouma. Thiang’s father, Pah, was a farmer and village secretary during the French colonial era. Speaking his mother’s native Souei language, Thiang would drive a buffalo drawn wagon far south, all the way across the Cambodian border, to buy and sell goods. The Souie people are closely related to the Khmer and lived throughout the area prior to the Lao. Their language and culture persists throughout parts of Laos, Cambodia and Vietnam to this day. As the eldest son, Onkeo spent the early years of his adolescence as a novice monk at the Buddhist temple on Don Xai. He learned about Buddhist philosophy and receive a basic general education at the temple. This tradition continues to be a common practice in many Lao villages to this day. Onkeo spent approximately three years at the temple, while his cousin, Thongsoune, would continue as a monk. Onkeo was an excellent student. His father sent him to live with relatives in Soukhouma to attend secondary school where he easily passed the exams without attending very many classes. In Soukhouma he also learned how to sew from his uncle, Bouala. Thiang was very proud of Onkeo. He bought his son a high quality sewing machine and sent him to the city of Pakse to for further lessons with hopes that he could become a skilled tailor. Onkeo had other aspirations. He sold the sewing machine to buy a motorbike and resolved to ride it as far north as possible. He had spent most of his young life in southern Laos, on the banks of the Mekong River, and now wanted to see the rest of the country. At age 16, Onkeo made it all the way to the capital city of Vientiane to join the Royal Lao Army. He had a petite body and was at first rejected because he could not meet the height requirement of 60 inches. The next time Onkeo was careful to wear heavy high heeled boots so he could more easily meet both the minimum height and weight requirements. After the enlistment process he was immediately sent to Xiengkhouang Province for training and active duty. The year was 1963.